It's generally agreed that, with enough hard work and determination, anyone can realize their dreams — but one very determined squirrel also got a little help from a man who likes to bake bread. Myron Huntley lives in the beautiful wild woods of Minnesota, a mile away from the nearest neighbor. He loves being immersed in nature, often filming and taking photos of deer, birds and landscapes. 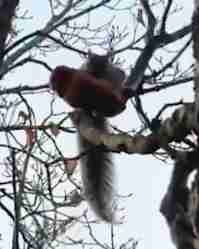 Fortunately for one squirrel, Myron Huntley also enjoys baking. "I make my own bread but sometimes it gets stale and hard before it all gets eaten, so I put it out," Huntley told The Dodo. 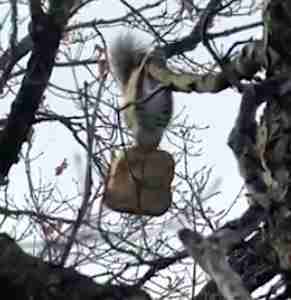 Huntley recently had about a quarter of a loaf that got too stale to eat — and the next thing he knew, it was up dangling in a tree, being grasped by a very excited gray squirrel Huntley calls Fat Joe. 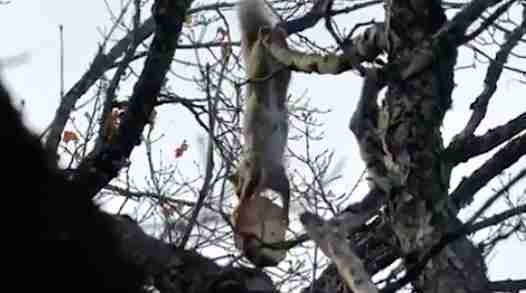 "I saw the squirrel take it and run toward the tree so I grabbed the camera and shot the video out of my dining room window," Hartley said. Fat Joe dangled by his back feet, while grasping the lucky windfall with his front claws, occasionally nibbling at the bread, as if to make his load a little bit lighter as he hauled it higher and higher. Huntley had seen Fat Joe many times before — but never quite this excited. "I coined the name Fat Joe on the gray squirrel cause he is always chasing the red squirrel out of the feeder and stealing his seeds," Huntley explained. When fate seemed to smile on Fat Joe in the form of a hunk of carbs, Fat Joe proved that he was up to the task. "He did eventually get home with the bread," Huntley said. While this squirrel was ecstatic about his find, it's not always a good idea to let wildlife eat human food. Learn the do's and don't's before being too generous.